After not being able to resolve my L1300 power problem, I am trying to get the data off of the hdd by using a brando sata/ide cable thingy. The attached pic shows the same connector I plugged into the the laptop hdd, and then put the usb cable into the front of a pc, the pc (running XP) recognises the hdd and says it is ready to use, however, I cannot see the drive when going to 'my computer'. Am I missing something/doing something wrong here? ... or is the laptop hdd caput? I think the power supply is too weak. I have a similar adapter. Mine came with an extra power pack. Do you use an external power pack for the HDD or is it only bus-powered via USB? If it is bus-powered, do you use a Y-USB-cable to increase the power supply? hikaru wrote: I think the power supply is too weak. Surely if the hdd is found and installed ready to use according to the pc means it has enough power?? 2,5" HDDs are designed to run with 500mA as specified by USB 2.0. However the start peak mostly needs a little bit more than 500mA. Clever boards don't allow the HDD to get more than 500mA via one USB-port. Stupid ones just give as much as is requested and toast your USB-port or even the USB-host earlier or later. The HDD controller will work with less than 500mA but the platters won't start spinning. So the drive might be detected correctly but cannot be accessed. Note that it has only one output but two inputs. 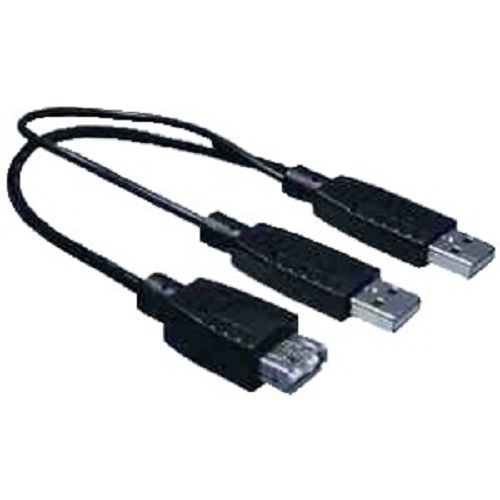 With a cable like this you will not only get the 500mA specified by USB 2.0 but another 100mA from a second port. This mostly is enough to come over the start peak of a 2,5"-HDD.